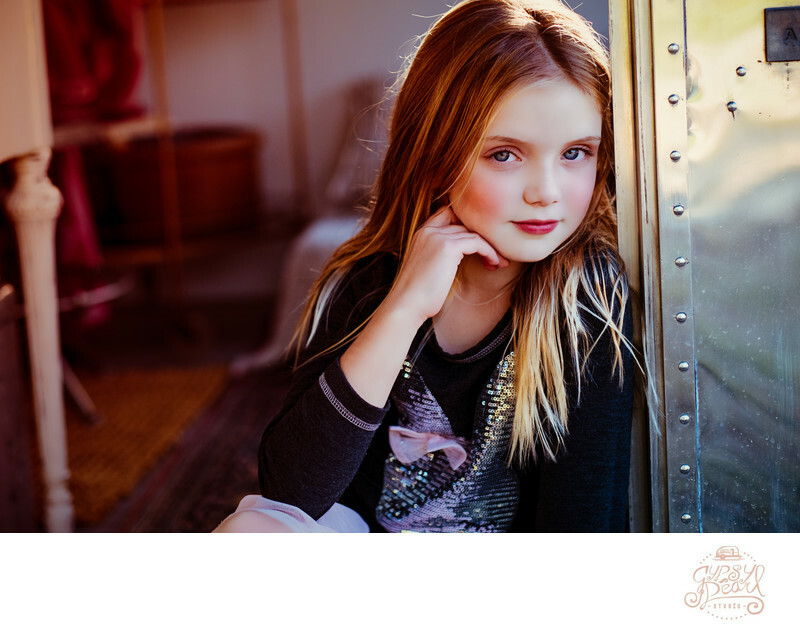 Stunning and sophisticated are words that sum up this children photography session. Brook of Houston made a trip with her family to visit Gypsy Pearl Studio and have photos done. We decided to photograph near a vintage Airstream. I liked Brooke's mature style and decided to use the silver backdrop as the ideal location for several of her photos. This airstream is rennovated from top to bottom. It is on the Gypsy Pearl Studio property and caters as a studio and changing room for clients who visit. I decided to stick with my prime lenses when photographing Brooke. The time was around sunset and the wind was perfect to add to the effect of movement. Giving such a serious look really showcases Brooke more mature side. However you can find her the majority of the time laughing and exploring outdoors with her younger brother Matthew. Gypsy Pearl Studio loves to cater to each individual children's session by creating a one of a kind experience that represents personality and charater. Brooke loved the airstream and being outdoors so this was the perfect backdrop to add to her style and reflect on how amazing she is. Location: 181 Rodgers Ravine Cove Driftwood Texas .